Reply with Template Outlook add-in settings. 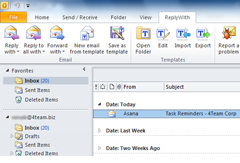 Outlook template reply now made easy with Reply With Template Outlook add-in. Easy access to Microsoft Outlook reply templates. After Reply With Template Outlook reply templates assistant is installed, you will find additional buttons in Microsoft Outlook toolbar. Template action button and menu options will help you to manage templates easily. Reply With, Reply to all with and Forward With buttons will let you to use pre-made templates to reply to email messages in just one click. You can also assign hotkeys to perform actions with predefined templates. Outlook template reply is easy in any Microsoft Outlook version. Reply With Template Outlook add-in is compatible with all Microsoft Outlook versions. It works with Microsoft Outlook 2000, XP, 2003, 2007 and 2010. It is compatible with Microsoft Windows® 2000/XP/2003/Vista/7. Outlook template reply will save your valuable time.